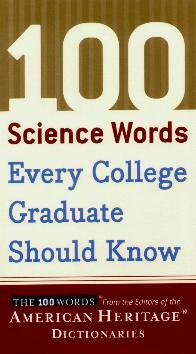 This book is one in a series of other "100 Words" books and, assuming you're a college graduate who took science or perhaps biology, why else would you need to know some of these words? Words like agoraphobia, cyclone, endorphins, ischemia, etc., you get my drift, are easier to recall. However, personally speaking, and because I went nowhere near science, words like amygdala, chemosynthesis, estivation, Fibonacci sequence, pahoehoe, piezoelectric effect, and telomere, were new to me. We hear new words on television, the radio, and in books (depending of course on what you read) and after having read this book, you're bound to absorb a few which you can toss about in some or other gathering. Just don't overdo it - there's nothing more boring, or irritating, than someone sprouting "big" words to get attention. Remember, less is more. I tested these words on a college graduate (physics) friend, who of course, correctly answered most of them and pointed out the correct pronunciation! I'll get him with the Word Lover Book! Other titles in this series include "100 Words Every High School Graduate Should Know", "100 Words Every High School Freshman Should Know", and "100 Words Every Word Lover Should Know". There's also a handy pronunciation guide - the last thing you want to do is to mispronounce your new "big" word and embarrass yourself. Conclusion - We all need to improve our vocabulary - why not learn something at the same time? I knew many more words than I initially anticipated - yay!